But what exactly is the correlation between the NIFTY, USDINR and OIL? A host of factors affect the prices of a widely tracked benchmark index like the NIFTY. Some of which are intrinsic (valuation, for example) and some that are external (capital flows, for example.) There relationships are dynamic – they keep changing over time. Also, macro variables usually have a time-alignment problem. For example, the closing-prices of the NIFTY don’t align with the closing prices of, say, the NASDAQ. So to analyze the NIFTY and NASDAQ together, the time-series need to be shifted. And, perhaps, NASDAQ futures being traded at NIFTY close should be considered instead. Comparing commodity and currency time-series with equity time-series has another problem. The former trades 24/7 in a global marketplace whereas equities predominantly trade in the local time-zone. So “closing” prices for commodities and currencies are hard to pin down at a granular level across markets. One way to tide over this issue is by using a weekly or monthly time-series instead of a daily one. For the longest time, Indian markets were insulated from global capital flows. It is only recently that we have opened up both or economy and our markets. Currency futures started trading only in 2008 and the RBI still tries to “guide” the exchange rate. With these in mind, lets run the correlation between the NIFTY 50, USDINR and OIL weekly return time-series with NIFTY 50 lagged by on time-period. 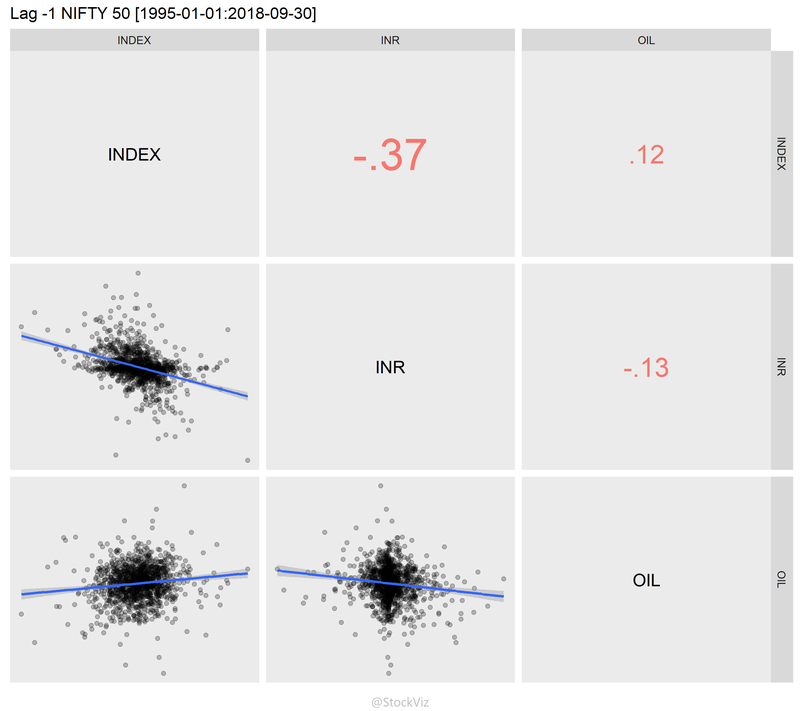 Data from 1995 through 2018 shows only a small correlation between NIFTY and INR. However, like we mentioned above, Indian markets now are more open than what they were before. 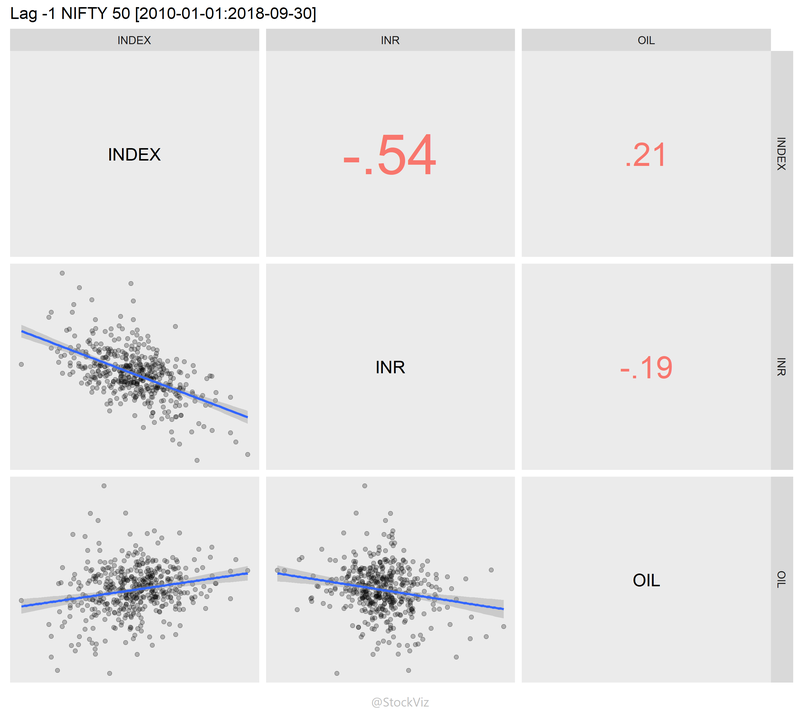 So, if you run the same correlations on a smaller dataset – year 2010 through 2018 – we can see an uptick in the NIFTY-INR correlation. It appears that the NIFTY has a closer relationship with INR than with OIL prices. In Part II of this thread, we will check if we can build a linear model that can capture this relationship. Stay tuned.